First of all, let’s get this out of the way: I’m a huge fan of Monty Python and the Holy Grail and of Monty Python in general. I saw the film on its first U.S. run, several times, and had, in my teens, committed to memory many Python routines, including most of the dialogue of the film. I resisted going to see the Broadway run of Spamalot because, frankly, the idea of actors trying to take on the variety of roles and voices that the Pythons themselves—Graham Chapman, John Cleese, Eric Idle, Terry Jones, Michael Palin, and sometimes Terry Gilliam and Carol Cleveland—originated struck me as a kind of sacrilege. But time goes on and we’ve got to get over that. Particularly as Spamalot has managed to bring to the stage the inspired inanity of the film, but with the advantage that the actors can actually hear the audience laughing. Where the film spoofed certain genres of film-making, not least the documentary and the arthouse film, Spamalot spoofs the stage and, particularly, Broadway musicals. Both film and musical, of course, spoof the august tale of King Arthur and his noble Knights of the Round Table, the search for the Holy Grail, and the mix of the fabulous and the folksy that comprises the world of legend. Idle, who had to go it alone without his former colleagues in converting their best-known work into a stage show, is clever in how he “lovingly rip[s]-off” (to use the official terminology) the film and adapts it to the stage. Tremendously popular, Spamalot has played all over the world—which is fitting as the good old British empire got about a bit. As staged at University of Connecticut’s Connecticut Repertory Theatre, directed by Richard Ruiz, with a few professional parts and the rest student actors, Spamalot comes across as a wacky romp trying to “find its legs.” The notion that Arthur has to put on a Broadway show, as charged by the Knights Who Until Recently Said Ni, feels like a quest indeed. Though production values may have been a bit different on Broadway, the show sends up professional theater while remaining true to what Idle conceived: taking aim at Broadway while aiming for Broadway. That means there are plenty of cheesy visuals that are remarkable for how serviceable they are—such as the castles for the outrageous French taunters and the plaintive plight of Herbert. There’s even catapulted cows and a hilarious plush, fanged rabbit. And a great variety of costuming by Heather Lesieur. The pros in the cast—Richard Kline as Arthur and Mariand Torres as the Lady of the Lake—together with choreographer Tom Kosis give this show its Broadway shine. The stagework throughout is lively and inventive (and special credit to Voice and Accent Coach David Alan Stern for keeping an ear to the original). Kline’s Arthur has the right straight-man tone—diffident and generally perplexed—but he can also soft-shoe and sing and break the fourth wall—“there goes my career”—all while seeming like an aging CEO trying to find out what makes his business go. And Torres, besides looking great in her various get-ups, from Disneyish princess to outlandish Vegas-style hoofer, handles the vocals given to the Lady—who is mainly only there to provide musical commentary—with joyous comic aplomb. But about that part: since most of the Python’s works were “boys only” affairs, with an occasional actual female cameo, mostly in the T&A category, there’s not much for a female star to do in Spamalot. Idle’s solution is to make that lack thematic, having the Lady gripe—in full-throated song—about being underused. It’s funny, yes, but misses taking advantage of the Zoot/Dingo dichotomy from the film, as the stage play—disappointingly—drops the entire Castle Anthrax scene. It should’ve been expanded rather than excised and then there would be some actual female “peril” and possibly a song or two for a female character that isn’t simply meta-commentary. The show is well cast, particularly in key roles: Gavin McNicoll is perfect as Pasty, Arthur’s overlooked Cockney assistant, who gets a major song, and Nick Nudler is rather Idle-esque as the cowardly “Brave” Sir Robin, who gets to lead the droll “You Won’t Succeed on Broadway”—very Gilbert & Sullivan—while, as Sir Lancelot, Bryce Wood does full justice to the delightful “His Name is Lancelot.” Both songs develop facts about the American stage—the prevalence of Jews and gays—in a breezy, poking-fun way. Like “The Song That Goes Like This” and “Twice in Every Show,” the song routines laugh at the convenience of conventions even while benefiting from them, for the sake of a laugh. And that’s pretty much the only take away from the show, as stated in “Always Look on the Bright Side of Life” (which Idle, who wrote it, cleverly steals from the Python’s other successful film, The Life of Brian): “They say it’s all a show, keep ‘em laughing as you go / Just remember that the last laugh is on you.” The laugh, initially, was that a show that spoofs successful Broadway musicals became a successful Broadway musical, winning three Tony awards. Here, the “last laugh” is that the show is also a delightful big production event for university theater with its infectious sense that it’s best not to take anything too seriously. C.P. 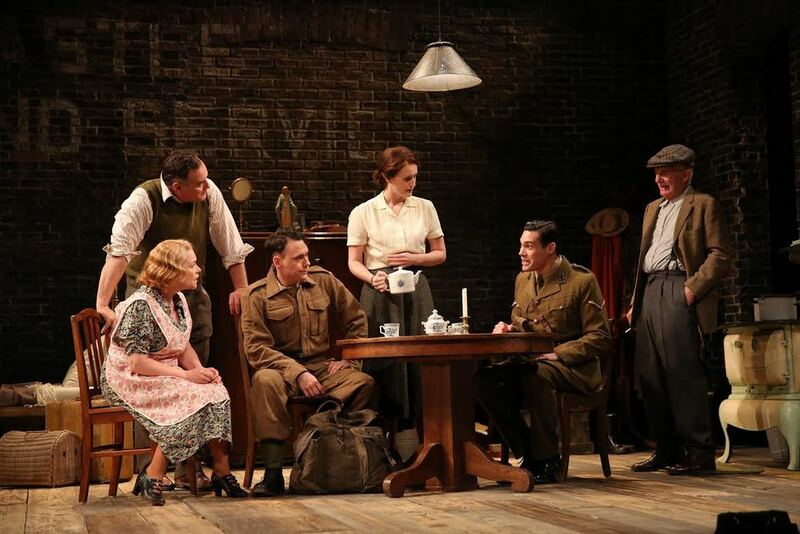 Taylor’s memory play And a Nightingale Sang, running through June 27 at Westport Country Playhouse, gives us Helen Stott (an incandescent Brenda Meaney), looking back at life in Newcastle, England, during WWII and at her family’s experience of day-to-day existence under the Blitz. From her first words, Meaney establishes a presence of such frankness, poignancy, and strength that we are willing to follow her wherever she might lead. Meaney's acting belongs in the highest ranks. For her performance alone, And a Nightingale Sang is worth seeing. The device of Helen’s direct address adds a pleasingly modern dimension to Taylor’s well-made drama. As the narrator, one moment Helen is introducing characters, the next she is explaining the subtext, and then for a time she melts into the action. Leisurely-paced and short on surprises, Nightingale is most powerful when Helen—whose limp has kept her (in her view) a spinster—tells her own coming-of-age story, which took place in her early middle years. David Kennedy’s direction, however, falls short of conveying the terrors of war, and thus this production slants a bit too far towards the comfortable and the bittersweet. The opening scene serves mainly to establish characters and introduce the working-class Stott family. Pretty younger daughter Joyce (Jenny Leona) is trying to decide whether to accept the marriage proposal of Eric (John Skelley), a soldier who is about to ship off to France; Joyce’s mother, Peggy (Deirdre Madigan), is desperately trying to get out of the house to visit one of the priests who, she fears, is having a war-related crisis of faith. Meanwhile Peggy’s father, Andie (Richard Kline), has just lost his beloved dog (whose dead body he has brought into the house in a cloth sack) and is trying to round up funeral goers. 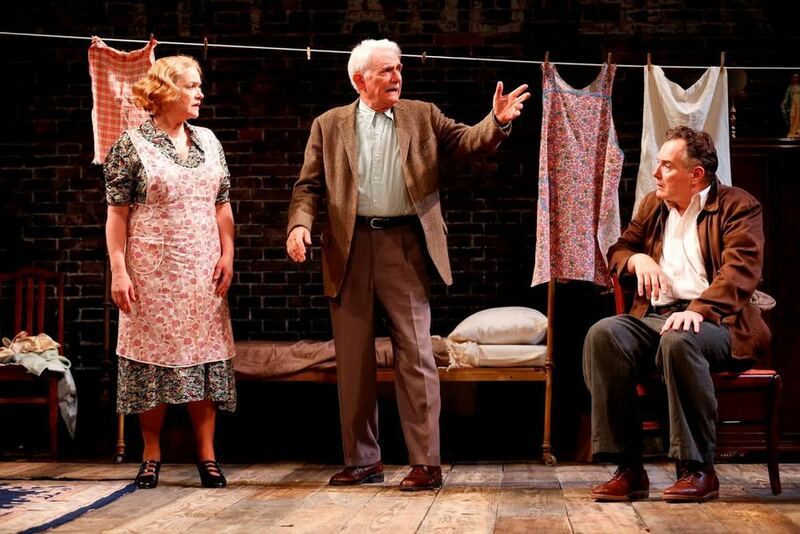 In the background, George (Sean Cullen), the father of the family, plays merrily on the piano and provides a humorous commentary on the cacophonous events. We immediately see that everyone in the family depends upon Helen for her good sense, kindness, and alacrity with a cup of tea. The war first intervenes at this point, in the form of sirens signaling a possible attack. 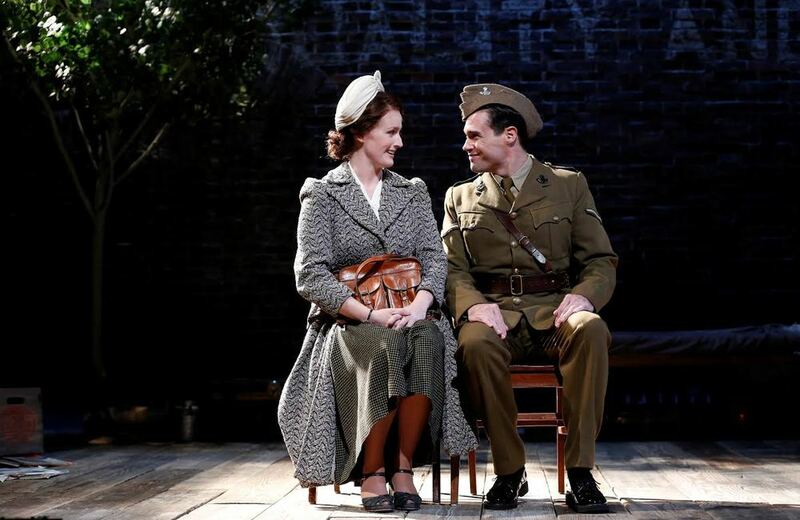 Because Helen’s memory drives the plot, the strongest storyline revolves around her love affair with Eric’s soldier friend Norman (Matthew Greer), the only man who has ever looked at her, much less declared his attraction and affection. Some of the sweetest moments occur here, as well as some of the play’s few genuine revelations. Greer is appealing, touching, and appropriately mysterious, while Helen’s emotional and sexual awakening brings to mind a more emotionally stable Laura, of The Glass Menagerie, if the Gentleman Caller had fallen for her and in doing so, changed her life. In the Stott household, humor, whether intentional or not, often pierces the darkness of the war, and Kennedy and his cast play up this element with crisp expertise. Indeed, these remarkable actors lift the script beyond its own limitations. Every performance shines. Sean Cullen brings a boyish twinkle to George Stott and sings and plays the piano as if he were born at the keyboard. As Peggy, Deirdre Madigan captures the conventionality of a staunch Catholic of her time and then layers this with unexpected nuance. Jenny Leona brings both fragility and fire to the role of Joyce. And Richard Kline, as Andie, delivers his fatalistic pronouncements, honed on the battle fields of WWI, with dry wit, while also conveying the vulnerability of a man who has come to love his pets as much as his family: Tibby the cat reminds him that he is still needed. As the soldier, Eric, John Skelley keeps us on his side even when his behavior is at its most churlish. Eric—one minute a fun-loving guy, the next minute a lout— is a tricky role, but Skelley, under Kennedy’s guidance, helps us to see a youth made by war to act the adult before he is ready. The scenic design, by Kristen Robinson, and the lighting design, by Matthew Richards, are to be commended too. The set is a large brick open space that serves most often as the Stott’s home, but that also remains abstract—like memory—so that two chairs brought downstage can become a park bench or a front parlor, and the characters can move through the central open space and enter a dance hall or a hotel or a homely flat. Richards’ lighting serves to create the effect of memory: when the spotlight isolates and illuminates Helen, we know we are in her mind, and when the light broadens, we know we are back in the scenes of the past. With such a strong design team—including sound design by Fitz Patton—one only wishes that Kennedy had chosen to make the moments when war breaks into the Stotts’ domestic concerns more jolting, terrifying, and real. Sirens should be louder, bombs should shake the theater walls, and flashing lights should blind. However, the terrific cast nearly makes up for this missing dramatic element: they bring to the stage their own brilliance, in all senses of the word.